Christmas is in full swing at Possability with clients, support, family and friends coming together to enjoy a Christmas lunch at several statewide celebrations over the last few weeks. William enjoying the Southern Christmas Party. 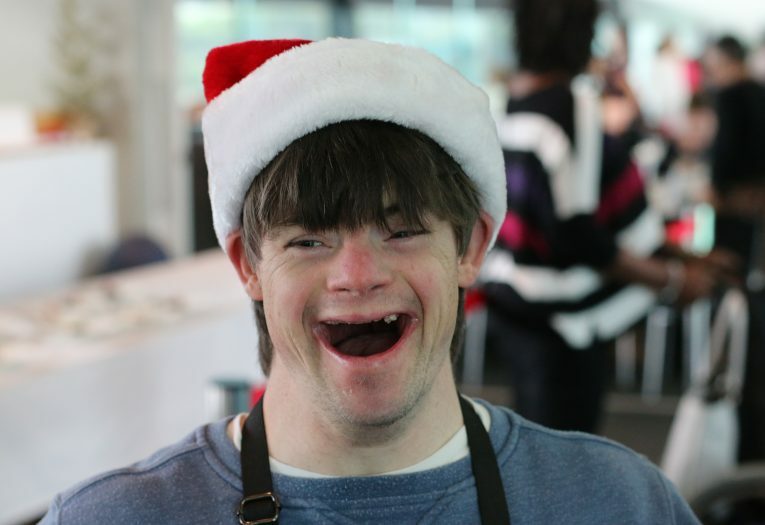 CEO Drew Beswick attended several of the functions and said that everybody embraced the Christmas spirit. The festivities kicked off in the North West with over 80 guests enjoying a fun day out at Camp Clayton. Guests enjoyed a Christmas lunch, activities and live entertainment. A special thank you to the North West Country Music Association for providing the musical performance. The annual Latrobe Children’s Respite Centre Christmas Party also returned again in 2017, with children, their families and friends coming together at the Centre to enjoy a lovely Christmas celebration. The celebrations continued in the South with 180 clients and support attending the Tasmanian Hockey Centre for a scrumptious two course Christmas roast lunch. Staff members took the opportunity to thank guests by serving the buffet lunch. The rain did not dampen the party spirit as guests enjoyed posing with a festive photo wall and crowd favourite rock act The Goodfellas had everyone out of their seats dancing! Launceston joined in and returned to UTAS Stadium where the Launceston Football Club provided a full Christmas spread. The Brown Cords played a full afternoon of entertainment and guests had fun taking snaps with a festive photo booth. Find some photos from the party on our Facebook page. A BBQ held at our Seven Mile Beach Respite Centre for Child and Youth services wrapped up the years events. We would like to thank everybody involved for making these events possible, from the staff and committees who give their time, effort and ideas, to the many vendors and entertainers who provide us with services, the support we receive for these events is fantastic and we are looking forward to another fun filled festive season in 2018. View our Christmas video here.